In today’s multi-channel world, customers expect brands to reach them via the channel of their preference. An HBR study found that 73% of consumers1 use multiple engagement channels in their interactions with a single preferred retailer. Marketers respond to this by creating omnichannel engagement strategies that assist customers in their micro moments. However, choosing the right mix of channels can be tough as factors such as reachability, message retrievability, deliverability, and supported media formats come into play. Push Notifications provide a low cost, highly contextual channel of communication to your users. It is one of the most popularly used engagement channels by mobile marketers. On average, smartphone users receive 46 push notifications in a day2. However, on average only 60% of Android users and 45% of iOS users opt-in to receive push notifications3. Naturally, with high opt-out rates comes the issue of reduced deliverability. The average deliverability rate for push notifications is as low as 35%. Your carefully crafted push notification can be futile if it doesn’t reach all intended recipients. The contributing factors for low deliverability include Opt-outs (40%-55%), followed by GCM/APNS (10%-25%) errors. Furthermore, the average click-through rate for push notifications is relatively low on both Android (10.7%) and iOS (4.9%)4. This means that for every 100 push notifications you send to a user, only 5-10 are ever clicked while the rest are ignored. That’s where App Inbox comes to the rescue. It can be used along with other channels to enhance the deliverability of campaigns since messages are delivered to users upon app launch. And it allows users the option to snooze until they are ready to go back to the app and engage with your brand again. Much like emails, it is a screen in the app that stores messages and even creates separate tabs or sections for different types of messages. Unlike in-app or push notifications that go away once you’ve interacted with them, App Inbox lets users access messages again, anytime – making it an ideal channel for messages that need to stick around. It is also a great way to reach users who have opted out of push notifications so that they can read your message at their convenience. With App Inbox, your interaction with users can be highly contextual as it supports a combination of simple messages, carousel messages and message with icons. You can play with a variety of media formats including video, GIFs, images, and audio which helps make the content more interactive and fun. You can also use App Inbox as a fallback channel for push notifications you can have guaranteed delivery of messages to your users. Think of campaigns where you want transactional messages to be stored and accessible to users right inside the app. 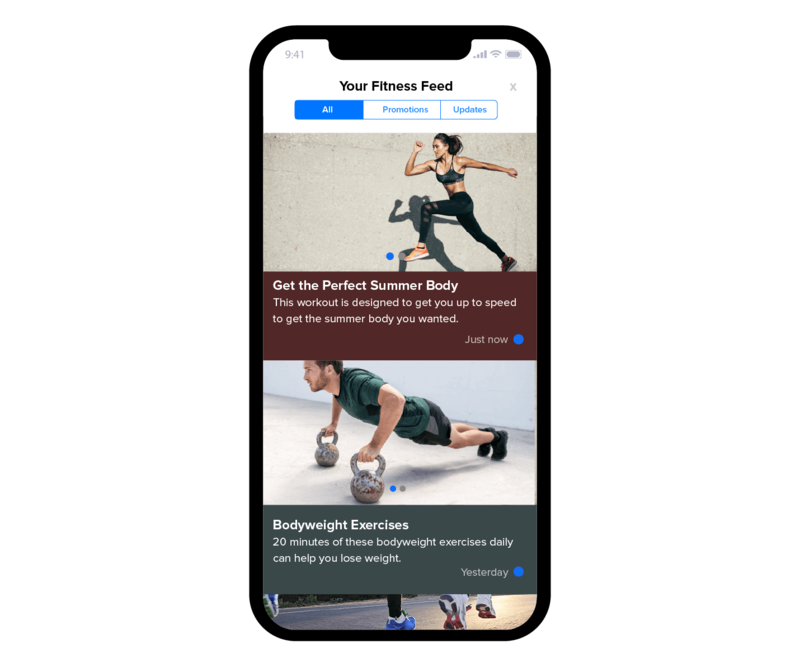 For example: you want to encourage users to join a gym (with a discount code that doesn’t expire) or send personalized offers for your ridesharing app (10% off your next 3 rides). Users love to scroll – whether it’s Facebook, Twitter, or Instagram. However, news feeds aren’t just in social or news apps. If you’re using content marketing as part of your marketing strategy, News Feed is a great way to keep your users informed.Using App Inbox, you can provide a News Feed to your users from within your app. You can easily customize the look and feel of the News Feed to suit your app’s UI. And you can do all this without even touching the code. Send Long-Lasting Offers (Coupon Codes)One major drawback of channels like push and in-app notifications is that they are not retrievable. Meaning, they become inaccessible once a user has clicked or swiped them. App Inbox helps you send messages that need to stay with the user for a long period. Messages such as promotional offers or coupon codes that don’t expire or are long lived. 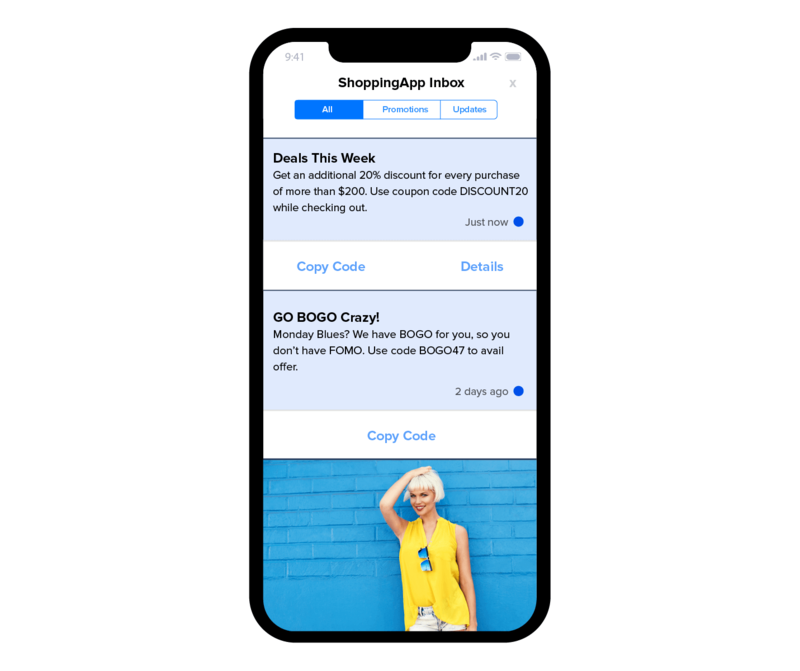 Even for time-sensitive offers, App Inbox is a viable channel as it allows users to copy the coupon code/text for use later on. Tabs, used to create separate sections in App Inbox, are useful to bucket messages of the same type in one view. For example: a tab for updates and another for promotions or offers. App Inbox can be used in many ways across stages like onboarding, conversion, retention, and advocacy.An effective customer lifecycle marketing strategy uses a mix of channels across the customer lifecycle. 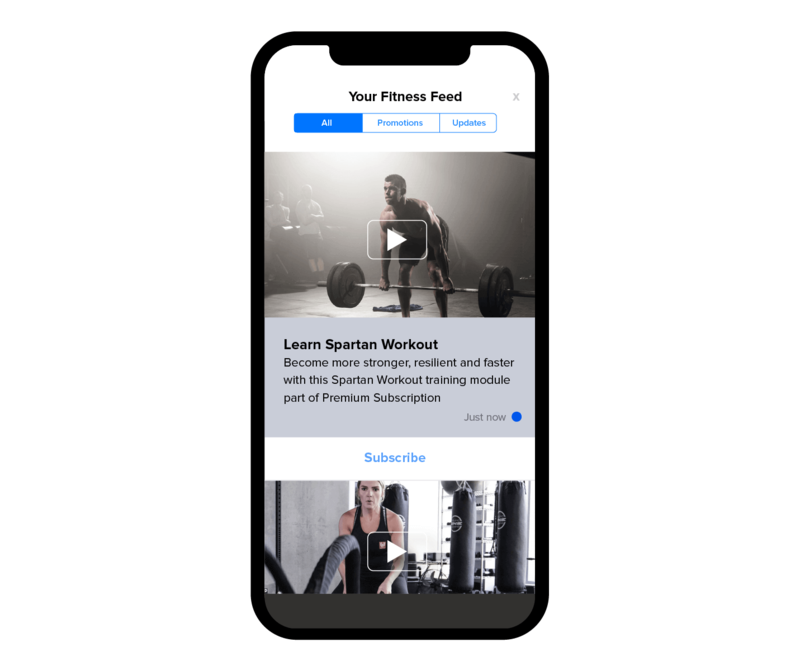 Starting from sending an onboarding email with a welcome message, then onward to showing the value your app delivers in order to convert users into paid subscribers. Depending upon the mix of channel and the stage of the target user segment you can orchestrate a comprehensive campaign using Journeys. For example: a campaign targeting new users of your fitness app who’ve not subscribed yet. App Inbox is not just another messaging channel to meet your marketing goals. It’s also an out-of-the-box UX enabler for your app. With its easy-to-use customizations, you can create an additional messaging section inside your app. You can use it for marketing purposes or to enhance the in-app user experience. The possibilities are immense. App Inbox is now available to all customers. Login to your account to see it in action. If you’re not a customer, schedule a personalized demo to see it live.